As years go, 2018 will probably be remembered as one when many citizens threw up their hands and cried, "WTF?" Abundant online think pieces have chronicled the growing number of "glitches" in our body politic (read: Donald Trump) that suggest we're living in a computer simulation à la The Matrix or an alternate reality created by CERN's Large Hadron Collider. Notwithstanding my layman's interest in particle physics and gravitational disruptions to the time-space continuum, I have zero expertise when it comes to evaluating such theories. That's not the only WTF question that confounded us this year; Seven Days regularly receives ones that we're in no position to answer. (More than a few relate to bodily functions.) Here are some of the odder ones we saw in 2018. QUESTION: "I've developed an itchy rash on my back, upper arms and stomach. There may be two possibilities. My wife bought lettuce from a different store, and I was working in the ceiling of a circuit board building room installing wiring and rubber drop cords. I've avoided both for two days. The rash and welts aren't as bad, but I'm still itching some. WTF?" ANSWER: Though "Ask your doctor" may be hackneyed advice, it's probably more useful than "Ask your local newspaper." QUESTION: "Almost every time I eat out anywhere I get urgent diarrhea. Do you have a clue?" ANSWER: Here's one: Grammatically speaking, "urgent diarrhea" seems redundant. QUESTION: "How can you find out if a particular wine is sulfite-free?" ANSWER: Uh, check the label. QUESTION: "Could sulfites or the lettuce cause body itching without a rash?" ANSWER: Oh, great. Another question about rashes, itches and sulfites. QUESTION: "I have three bouts of diarrhea and vomiting from eating salads at restaurants. All three times, my blood pressure plummeted and I was dehydrated. I had to go to the [emergency room] all three times. I can only find sulfite articles related to respiratory ills. I am almost certain my issues have to do with sulfites. What is your opinion?" ANSWER: Another question on sulfites, diarrhea and salads. What, no rash? QUESTION: "Why do the same numbers occur when one looks at a clock? One example: frequently seeing the same time ... 7:17 p.m."
ANSWER: The likeliest explanation of why our reader notices the same times popping up repeatedly on his clock — presumably a digital one — is neurological. Basically, the human brain is a pattern-recognition machine that's predisposed to spotting recurrent events in its environment, such as repetition (7:17) and sequentiality (12:34). Pareidolia is a psychological phenomenon in which the mind reacts to stimuli, typically images or sounds, by finding patterns whether or not they exist. Common examples include seeing human faces in the grills of cars or animals in clouds, hearing subliminal messages in recorded music when played slowly or backward, and perceiving human voices in the white noise generated by fans and air conditioners. Pareidolia is completely normal, more common in women than in men and more frequently reported by the devoutly religious. Hence all those people who claim to have seen Jesus or the Virgin Mary in tortillas and slices of toast. QUESTION: "Vermont, a state that wants to stop the opiate crisis, does not acknowledge that wheat, barley, rye, corn and maltodextrin are, in fact ... low-grade opiates but still opiates, addictive and dangerous in every way. I spent my entire life sick, fogged over and my memory wiped out every day by this crap the government calls food, and I am by no means alone. Where is the story of ... people being drugged?" ANSWER: Strictly speaking, wheat, barley, rye, corn and maltodextrin — the last is a highly processed starch derived from corn — are not opiates, because they're not made from the juice of the opium poppy. That said, it's no cockamamie conspiracy theory to suggest that grains and starchy foods can make certain people feel like they've taken a shot of heroin. According to a November 2015 article in the Journal of Health, Population and Nutrition called "The Opioid Effects of Gluten Exorphins: Asymptomatic Celiac Disease," for some people "gluten can be degraded into several morphine-like substances, named gluten exorphins. These compounds have proven opioid effects and could mask the deleterious effects of gluten protein on gastrointestinal lining and function." Indeed, for people with asymptomatic celiac disease, gluten exorphins can cause constipation, just as opiates do, and mess with their metabolism of serotonin, a neurotransmitter associated with feelings of happiness and well-being. As for these grains' purported link to Vermont's opiate crisis, however, that's a bit of a stretch — unless one subscribes to the "gateway drug" theory that distilled spirits, which are made from such grains, increase one's likelihood of experimenting with stronger intoxicants. 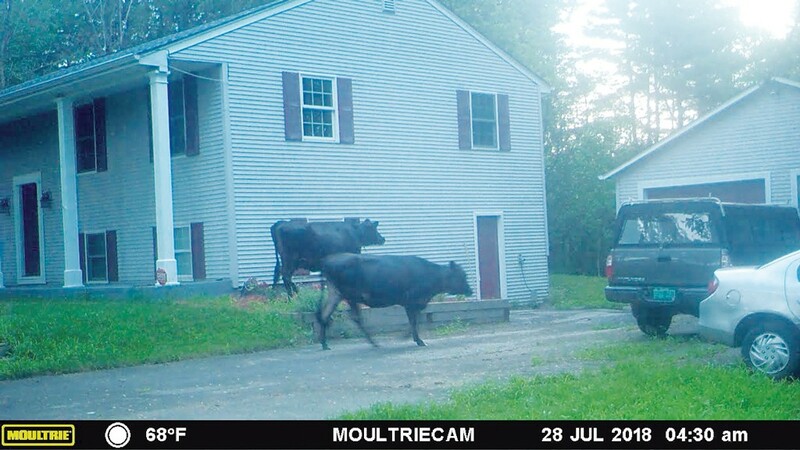 Finally, an in-house WTF question: Jordan Adams, Seven Days' music editor, wants to know where the black Angus cows that appeared on his parents' lawn in Charlotte came from. Last summer, Adams' father discovered physical "evidence" (read: cow patties) on his property, whereupon he checked his game cam and found photographic evidence of the ungulates' overnight trespass. The visitation was all the more puzzling since the nearest beef farm is more than a mile away and across a busy road. No answer yet, but I'll stay on this story until the cows come home.